I write these words in loving memory of my daughter Cassandra, who was born with mitochondrial disease. 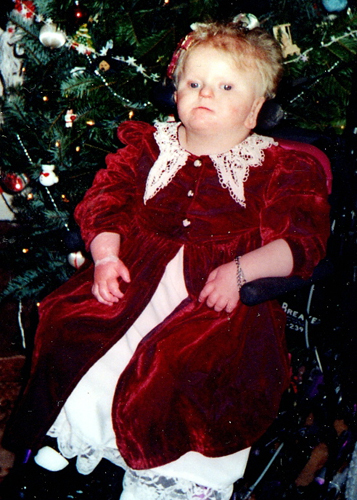 As a result of this disease, Cassandra suffered from epilepsy, hearing and vision impairments, developmental delay and other medical problems. Three-year old Cassandra was wheelchair bound and unable to sit up or rollover without assistance. But she had a smile that lit up a room and a laugh that we know was straight from heaven. Cassandra Elizabeth Simmons passed away on May 19, 2003 four months before her fourth birthday. Please help honor the memory of our little angel and other “mito” children like her by supporting the Mitochondrial Research Guild of Children’s Hospital. We need to find a cure for this deadly disease to help other children lead a normal and prosperous lives.